The annals of Los Angeles DUI history are replete with stories of famous politicians, business owners, celebrities, and athletes busted for driving under the influence in sordid situations. This alone should debunk the myth that only incompetent or irresponsible people get busted for this crime. Add another iron to that fire: Jim Irsay, the owner of Indianapolis Colts, found himself in handcuffs on Sunday night in Carmel, Indiana, facing four felony counts. Authorities say that the 50-year-old football club owner had been driving at a very slow rate of speed. He stopped in the middle of the roadway and failed to turn. A Police Department spokesperson, Lieutenant Joe Bickel, said that “during the course of the investigation, Irsay subsequently failed several roadside field sobriety tests … [and then police found] multiple prescription drugs … and pill bottles” in his vehicle. If convicted of his felony charges, Irsay will face punishments like jail time, the loss of his license, mandatory alcohol classes, and major fines and fees… as well as disciplinary action from the National Football League. In 2010, Tom Lewand, the President of the Detroit Lions, paid a $100,000 fine to the League and faced a 30-day suspension after he pled guilty to driving under the influence. 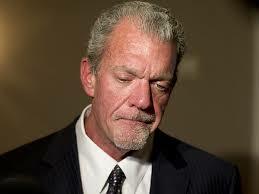 Irsay recently separated from his wife of 33 years – Meg Irsay – in November 2013. Sometimes traumatic life events, like a new divorce, can lead to addictive behavior and to drug DUIs. In Southern California, if you’re arrested for a similar crime, you’ll face charges per California Vehicle Code Section 23152(a), which makes it a crime to drive under the influence of alcohol, drugs and illegal narcotics as well as prescription or OTC pain meds. Of course, there are no breath tests that can be used in cases like this – instead, a police officer will administer a blood or urine test, if you are suspected of being under the influence of drugs. Your performance on field sobriety tests and the officer’s judgment of your sobriety can also play a role in determining your guilt. For help defending a Los Angeles DUI drug case, call Michael Kraut at the Kraut Law Group immediately. Mr. Kraut is a Harvard Law School educated ex-prosecutor, and he regularly consults with major media (e.g. KTLA, the New York Times, Good Morning America, etc) about big DUI news events.